“YOU have to hand it to some of these IRA boys,” Margaret Thatcher once remarked of the republican hunger-strikers who embarrassed her in 1981. “What a terrible waste of human life!” she said of the ten who died. Since some of the hunger-strikers at Guantánamo Bay are being force-fed through nasal tubes, Barack Obama may be spared Mrs Thatcher’s grief. But he has been shamed by their desperate gambit all the same. The protest is a reminder of one of his most glaring failures in office. Officials count 100 hunger-strikers; lawyers for the detainees say there are 130; on any reckoning, a majority of the 166 remaining inmates are starving themselves. Through their lawyers, detainees complain of a rougher regime since the army took over guard duties from the navy last autumn. In particular they allege that their Korans were mistreated during an inspection in February, when the hunger-strike began (prison authorities vigorously deny that). A cell-block raid by guards on April 13th (provoked by the covering up of security cameras), during which some prisoners were shot with rubber pellets, hardened rather than broke the strikers. Mr Obama said this week that Guantánamo “hurts us in terms of our international standing.” That echoed the view he espoused when, on his second day in office in January 2009, he ordered the prison to be closed within a year. Its existence since 2002, he said, had “likely created more terrorists around the world than it ever detained”—an opinion eventually shared by assorted veterans of George W. Bush’s administration. And yet the only Guantánamo-related closure so far has been the shutting, in January this year, of the diplomatic office charged with resettling the inmates. Mr Obama blames Congress—with some justification. It thwarted his original plan to transfer the detainees to a facility in Illinois. Then, either out of concern for national security, a yen to embarrass the president, or both, in clauses inserted into successive defence-spending bills Congress made it difficult for officials to transfer anyone anywhere. Difficult, but not impossible: Mr Obama can authorise transfers using a presidential waiver. He has chosen not to. (After a bomb plot with links to Yemen at the end of 2009, he also chose to halt transfers there—and most of the remaining prisoners are Yemeni.) He evidently calculated that, given the battles he is already waging with Congress, Guantánamo was one he could do without. 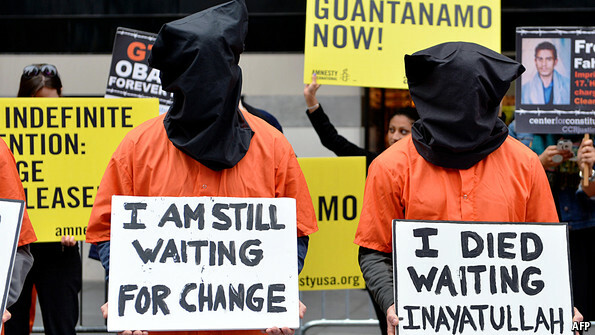 That stalemate has been an especial let-down for the 86 residual prisoners who, in 2010, were slated for transfer out of Guantánamo by a presidential review; some had already been designated for transfer under the previous administration. Many of these men claim to have committed no offence except being in the wrong place—Afghanistan—at the wrong time, or to have been sold to American forces for the bounties they offered. One such, and one of the hunger-strikers, is Shaker Aamer, a British resident picked up in Jalalabad in 2001 and allegedly tortured. His lawyer, Clive Stafford Smith, points out that the British government is well-equipped to monitor Mr Aamer should he be repatriated. According to the review, many of these men were low-level fighters rather than total innocents. 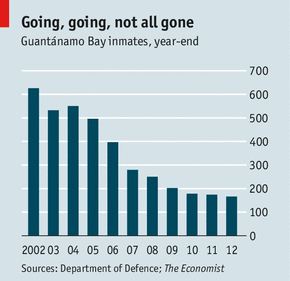 But none has been charged with a crime—and most have been at Guantánamo for over a decade. In fact, only seven of the 779 prisoners who have passed through the camp have been convicted by its military tribunals (and two of those verdicts have been challenged). Of those still there, only three have been convicted and only six currently face trial, including Khalid Sheikh Mohammed, the alleged mastermind of the September 11th attacks. Subject to multiple legal challenges, beset by scandals over hidden microphones and leaked defence documents, the tribunals are now regarded as a failure even by those untroubled by their dubious legal status. As Mr Obama pointed out, federal courts have proved a much more effective forum for prosecuting terrorists. The result, at the camp, is near-total stasis. No new prisoner has arrived since 2008; none has left for over a year. Parole-style hearings planned for the group not designated for either trial or transfer have yet to begin. Prisoners have lawyers, but there is little the lawyers can do for them. This bleak situation, says Mr Stafford Smith, is worse than being on death row. Beyond the feeling of personal betrayal by Mr Obama, the detainees also sense—correctly—that the attention of the foreign leaders, human-rights watchdogs and United Nations officials who once energetically protested at their predicament has wandered. The outrage that the manacled, blindfolded, jumpsuited figures first provoked has dimmed. Drone warfare has become a much bigger human-rights preoccupation. And yet, unpropitious as it might seem, the prisoners also fear that this may be their last chance to get out. Mr Warner says that if, with the president’s views and legal background, Mr Obama “can’t get this done, I don’t know who could.” It is hard to see a future presidential candidate matching his troublesome pledge to shut the prison. And for Mr Obama as well, time is running out. Even if he chose to use his waiver powers, and leant on other governments to accept detainees, the diplomacy, including gathering the necessary assurances on security and humane treatment, would take time. Meanwhile the Guantánamo authorities are seeking an extra $200m for refurbishments, on top of annual running costs that wildly exceed those for ordinary prisons. They are planning new medical facilities to care for elderly detainees. This entry was posted in Activism, Freedom, Legal, Military, Political, Prisoners, Protest, Terrorism. Bookmark the permalink.